are highlighted in pink. Newly configured conference rooms are highlighted in green. The main entrance to the NAS Building is now — as it was in 1924 — on the façade facing Constitution Avenue. The cruciform floor plan and its main axis extending from the Constitution Avenue entrance — an element of Goodhue's original design – have been restored in line with the original vision for the building. This more intuitive floor plan, has a practical effect, it makes navigation of the building easier. Improvements in the infrastructure comprised the major work and the major cost of the restoration. During the restoration, the entire infrastructure — outmoded and fragile after decades of use — was replaced, including heating and air conditioning systems, electrical and data systems, and plumbing systems. 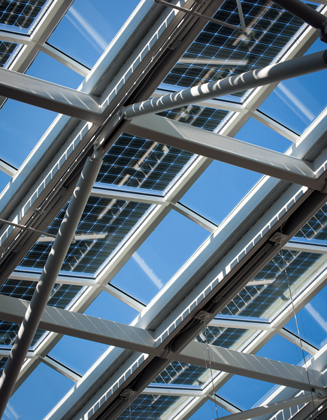 This improvement in infrastructure and the addition of new solar technology, including photovoltaic cells on the roof top and in the glass roofs of the enclosed courts, are estimated to reduce energy use by 25 percent. The new telephone and data networks that have been installed will provide greatly enhanced communication capabilities. Many of the architectural finishes, such as wood, carpets, tiles, and fabrics, have been chosen from renewable sources or recycled materials. New spaces have been created by reconfiguring existing offices and corridors and by enclosing areas previously open to the air, including three enclosed courtyards that can now be used as gathering places, informal meeting areas, and for receptions and dining. Situated adjacent to the Rotunda, the North Court was created by enclosing a gap between the original 1924 structure and the newer West Wing constructed in the 1960s. It added 1,200 square feet to the building, and serves as an anteroom and reception area for two new conference rooms, one with a capacity of 90 and the other with a capacity of 28. A third new conference room with a seating capacity of 100 people is located in the northeast corner of the building. An adjoining reception area between it and the Board Room to the south serves both meeting rooms as a reception area and informal gathering place. The West Court, created by enclosing an outdoor courtyard, is now a large (2,000 square feet), covered space for receptions and dinners, easily accessible through two large sets of double glass doorways along the hallway that leads west from the Great Hall toward the Rotunda. The ceiling of this court is glass, embedded with photovoltaic cells, filling it with light and making it now suitable for year-round use. 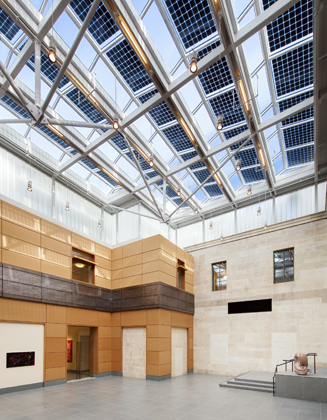 The glass ceiling of the newly-enclosed West Court is also lined with solar photovoltaic cells. © 2012 Maxwell MacKenzie. Skylight with solar photovoltaic panels. © 2012 Maxwell MacKenzie. The East Court, created by covering an open-air light well that was previously inaccessible, is located adjacent to the Lecture Room and now serves as an ancillary area for meetings in the Lecture Room, as well as a location for receptions and dining. The glass ceiling of this 1,500 square-foot court is also equipped with photovoltaic cells. 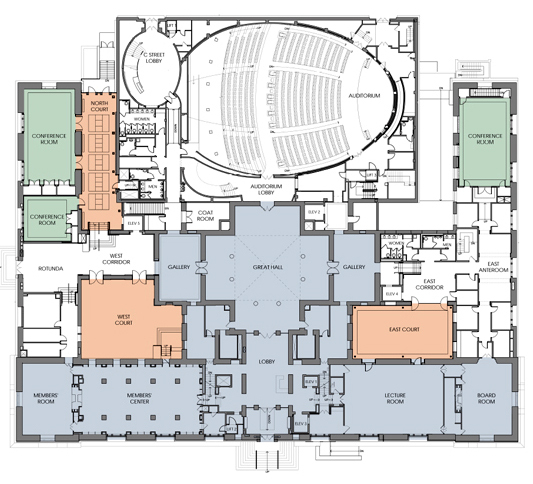 In addition, a smaller open-air court in the refectory and light wells in the original Goodhue section were converted to interior spaces, and a new third floor corridor was added to connect the Goodhue section with office space above the Auditorium. In all, 6,200 square feet of usable indoor space was added during the restoration. The Auditorium has been refreshed with a new carpet and new upholstery for the chairs. The audio-visual system has been brought to current standards. Seats are labeled with the names of members who have contributed to the restoration. The original Goodhue design of the building included exhibition rooms flanking the Great Hall that were used for public exhibits as described above. In the spirit of the original vision for the building, some of these spaces have been restored. During the process of restoring the space now known as the East Gallery, an unexpected architectural detail was discovered: an intact, coffered ceiling with a skylight. Luckily, the original ceiling had been covered over rather than demolished when the building was expanded in 1965. To mimic the original impact of a skylight, artificial lighting has been installed in a cavity above the ceiling. Repairs were made to the ornamental plaster and wood to return the space to its original appearance. Today this gallery houses an exhibit of the history and work of the NAS and a history of the NAS Building and its restoration. Diametrically opposite, across the Great Hall, the West Gallery is now used for temporary exhibits of contemporary art. A replica of the original coffered ceiling with a skylight in the East Gallery has been installed in this space. In keeping with the return of the main entrance to Constitution Avenue, a new driveway and passenger drop-off area have been created on the east (21st Street) side of the building with a pedestrian ramp leading to the main entrance that now includes an elevator in addition to the original marble staircase to the entry doors. New landscaping has been installed throughout the grounds and in the flower beds leading from the street, with a color scheme favoring purple and gold (the Academy colors) and white flowering perennial plants. The landscaping around the Einstein statue now makes it possible to see the monument from Constitution Avenue. As viewed from Constitution Avenue, the whole aspect of the NAS Building, the Einstein monument, and the grounds conveys a sense of greater openness that is evidenced by an increase in the number of people visiting the monument and the public spaces in the building. NAS Building as viewed from Constitution Avenue © 2012 Maxwell MacKenzie.